In humanity’s more than 100,000-year history, we have evolved from vulnerable creatures clawing sustenance from the earth to a sophisticated global society manipulating every inch of it. In short, we have become the dominant animal. Why, then, are we creating a world that threatens our own species? What can we do to change the current trajectory toward more climate change, increased famine, and epidemic disease? Renowned Stanford scientists Paul R. Ehrlich and Anne H. Ehrlich believe that intelligently addressing those questions depends on a clear understanding of how we evolved and how and why we’re changing the planet in ways that darken our descendants’ future. The Dominant Animal arms readers with that knowledge, tracing the interplay between environmental change and genetic and cultural evolution since the dawn of humanity. In lucid and engaging prose, they describe how Homo sapiens adapted to their surroundings, eventually developing the vibrant cultures, vast scientific knowledge, and technological wizardry we know today. But the Ehrlichs also explore the flip side of this triumphant story of innovation and conquest. As we clear forests to raise crops and build cities, lace the continents with highways, and create chemicals never before seen in nature, we may be undermining our own supremacy. The threats of environmental damage are clear from the daily headlines, but the outcome is far from destined. Humanity can again adapt—if we learn from our evolutionary past. Those lessons are crystallized in The Dominant Animal. 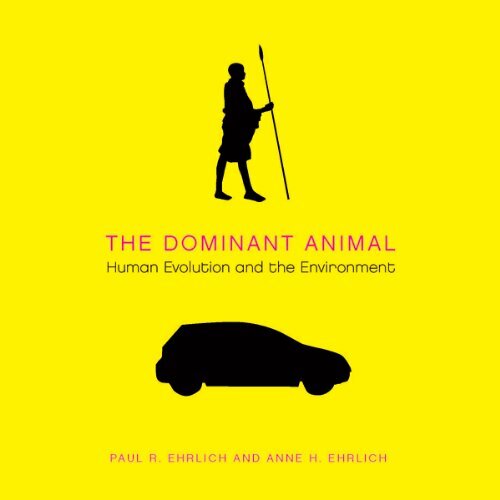 Tackling the fundamental challenge of the human predicament, Paul and Anne Ehrlich offer a vivid and unique exploration of our origins, our evolution, and our future. Unfortunately this book was so poorly read it was difficult to determine the value of the content.